One obvious outcome of the massive demand for online shopping and for e-fulfilment and multi-channel distribution centres is that the measure of success will depend on how quickly and flexibly the various automated handling systems can deal with a greatly expanding market. For certain areas of retailing however, such as the fashion industry, there is another emerging issue. The massive increase in customer returns. Retailers need to be able to deal with returns as efficiently as possible by minimising costs, and improving product availability. If customer returns form a significant part of company ‘sales’ then systems need to be in place in order to return goods back into storage, pending suitable inspection, in order to ensure that goods are re-circulated as quickly as possible available for resale. System integrators are the ideal partners when considering sortation systems, and as a company with over 30 years experience in the industry, are able to offer advice on how best to maximise the efficiency of handling customer returns. Andrews Automation Ltd are able to ‘think outside the box’ and move outside the company’s standard product range in order to integrate a complete materials handling system into you existing operations. 3) Operational capacity, which can be influenced by many factors. When a wide variety of SKUs are being stored, Pareto’ law will be inevitable. 80% of sales coming from 20% of SKUs. Many logistics managers may not be aware is how much of a problem, slow-moving items can potentially be. ‘Slow movers’ may only represent a small number of total worker picks, but may account for upwards of 40% of labour costs. This is due to the fact that they are usually situated in distant warehouse locations. The implications of slow-moving stocks can be so great that Britain’s big food retailers are looking into reconsidering their entire SKU range. 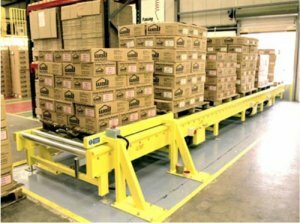 One major consideration regarding fast sortation conveyors is that the longer they are in use, the shorter their Return On Investment. Why not consider using them to deal with both inbound and outbound processes? Are you looking to reduce costs and increase productivity? No rest for the wicked with Pallet Handling!